"The entire world outside is based on your thoughts and mental attitude. The entire world is your own projection. Your values may change within a fraction of a second. Today you may not even want to see the one who was your sweet honey yesterday. If we remember that, we won't put so much stress on outward things." San Francisco has turned me into a scrounger. I consistently watch the ground passing under my feet, as it often turns up fantastic treasures. My most recent finds were $5 in a Valencia St. gutter, a debateably real Chanel scarf and a copy of Deepak Chopra's Jesus. The $5 bought a Mission burrito, the scarf (which is fabulous, real or not) will be worked into my Pride wardrobe, and the book became my weekend reading material. In Jesus, Chopra sets out to create a 'map of enlightenment' through a fictional account of Jesus' life during the "lost years" between age 12 and 30 that are not covered in the New Testament. He believes that Jesus was indeed a sacred savior, but that he was not innately divine- he had to discover this potential and special destiny, and learn to fulfill it. The story does not contradict anything that Jesus taught, it seeks to understand how he came to be who he was (and is) to the world. The other day I saw a friend I hadn't seen in a while and asked him what was new. His reply: "Everything! All the time!" And of course he's right. In the continuous flow of life, change is the only reliable element. We lose track of this basic reality when life takes on predictable, safe schedules and routines, and it doesn't seem like anything really is new or changing. When something tragic or otherwise momentous occurs, we are brought back to the truth that life is actually pretty chaotic and we are never far from moments that will de- and re- construct our lives completely. Even when it's not obvious and dramatic, we are all still always changing. Last night I got some disheartening news. I spent the earlier part of today feeling pouty and impatient with God. "Seriously," I thought, "What's the hold up? I know what I need so why am I not getting it?? Now." After mildly sulking all day, I marched off to teach yoga, still feeling deprived and slighted. I distractedly started teaching, deciding to change sets at the last minute and (feeling like I was) barely getting through the class. If you've been a student in enough yoga classes, at some point an instructor has probably told you to "work your edge." If you're a yoga instructor, at some point you've probably said this to your students. I've said it as an instructor, heard it as a student and only vaguely understood what that actually means until now. 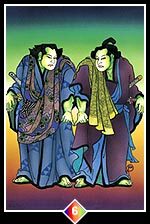 "The two figures on this card remind us of the sleazy and conspiratorial situations we can get into when we compromise our own truth. It is one thing to meet another halfway, to understand a point of view different from our own and work towards a harmony of the opposing forces. It is quite another to "cave in" and betray our own truth. If we look deeply into it, we usually find that we are trying to gain something--whether it is power or the approval of others. If you are tempted, beware: the rewards of this kind of compromise always leave a bitter taste in the mouth."